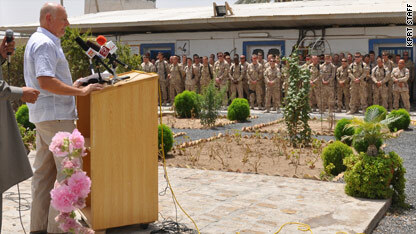 Bill Harris, deputy director of the Kandahar Provincial Reconstruction Team, speaks at a ceremony honoring "Popeye" at Camp Nathan Smith. A large number of both coalition personnel and local residents attended. We’d been at Camp Nathan Smith in Kandahar City for a matter of hours when a Canadian Public Affairs Officer offered up a story. Captain Cynthia Larue was not the type of PAO to try to sell you a puff piece to boost the “good news quota,” but rather someone who knew a good tale when she saw one. Among the many repressive things the Taliban forced on Afghans was the banning of all music for being "sinful." Today, with the Taliban still an influence, and the country still very conservative, music is back … although who knows what the Taliban would make of Kabul Dreams. This place was a cannery, for many years pumping out thousands and thousands of cans of fruit every day. But for one year, during Taliban control of Kandahar, it was something very different. This cavernous, and now eerie storage area became a prison, hell for a 1,000 men. Through it all, Popeye was here – he came when he was 13 to work in the cannery, and that was 45 years ago. Popeye’s not his real name of course — the Canadian soldiers nicknamed him for his work ethic. He still fears the Taliban to the point where he doesn’t want his face shown, but wanted to show us what the prisoners left behind — drawings that paint a vivid picture of their misery. KANDAHAR, Afghanistan — There are "press clubs" the world over, from Hong Kong to Sydney, New York to New Delhi — places where journalists can gather, network, maybe grab a drink. Some are small and convivial, others large and even ostentatious. But I can’t think of any with armed guards on the roof, and surrounded by concrete blast walls. Welcome to the Kandahar Press Club. KABUL, Afghanistan — Unspecified "threats" have forced the United Nations in Afghanistan's second biggest city to order its local staff to stay home until further notice. The order involves more than 200 Afghan employees in Kandahar. Several foreign staffers have been moved to the capital, Kabul. 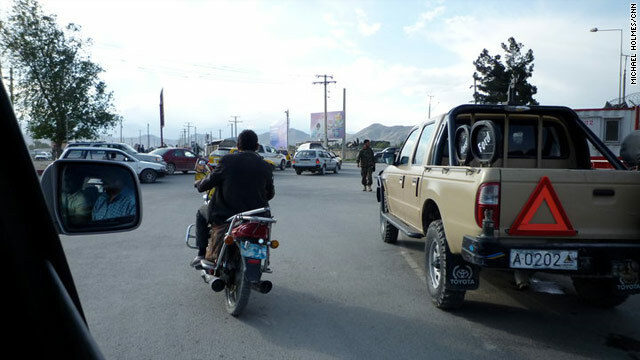 The action follows what a U.N. source said were "threats against the U.N. operation in Kandahar." KABUL, Afghanistan — When I was in Afghanistan early in 2002, I covered a story on what we all thought was the very essence of optimism — the appointment of a Tourism Minister. Needless to say, his poisoned chalice of a job didn’t get much traction at the time. Occasionally since, the idea of a vibrant tourism industry here has re-surfaced — there is still a Tourism Minister — and some “adventure tourists” have indeed tiptoed through the landmines and firefights to discover the undeniable beauty of this country. There is no debate that Afghanistan has much to tempt travelers — this is a country rich in tourism potential. Towering cliffs and deep caverns, stunning lakes (Band-e-Amir has to be seen to be believed), and rugged vistas abound, alongside a culture rich in history. For those turned off by resort vacationing, or ABC (“Another Bloody Cathedral) tours, this is a peach of an alternative.